ZooKeeper root (recommended): The root ZooKeeper node, under which all cluster namespace nodes are placed. ZooKeeper namespace (recommended): The namespace ZooKeeper node, under which all required coordination data for a cluster is placed. Important: if you are running multiple Flink HA clusters, you have to manually configure separate namespaces for each cluster. By default, the Yarn cluster and the Yarn session automatically generate namespaces based on Yarn application id. A manual configuration overrides this behaviour in Yarn. Specifying a namespace with the -z CLI option, in turn, overrides manual configuration. This means that the application can be restarted 10 times before YARN fails the application. It’s important to note that yarn.resourcemanager.am.max-attempts is an upper bound for the application restarts. 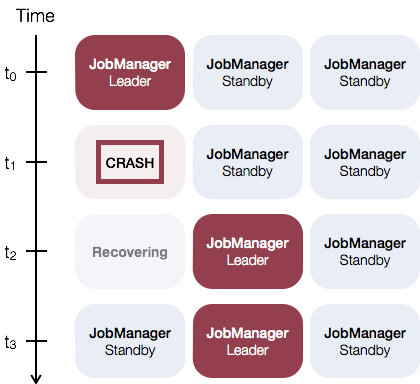 Therfore, the number of application attempts set within Flink cannot exceed the YARN cluster setting with which YARN was started.